The Mary Rose sank in the Solent on 19th July 1545, just over a mile from the dock where she was built in 1509 for Henry VII. During the excavation of the wreck more than 20,000 finds were recovered from the seabed. Over 1,000 of the objects recovered from the ship are displayed in the Mary Rose Exhibition. The Mary Rose is now situated in Dock 3 alongside HMS Victory. 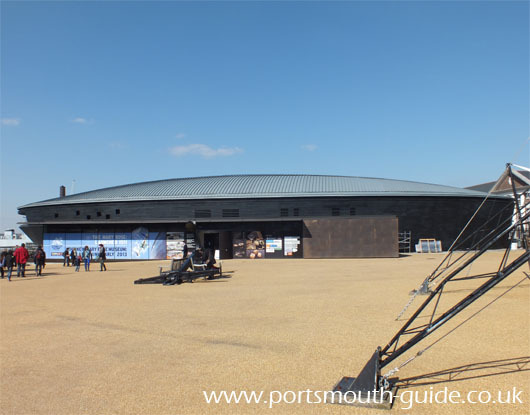 The Mary Rose Museum houses many artefacts from the ship and models of the ship. There is also a movie to enjoy which details how the ship was recovered from the sea bed. 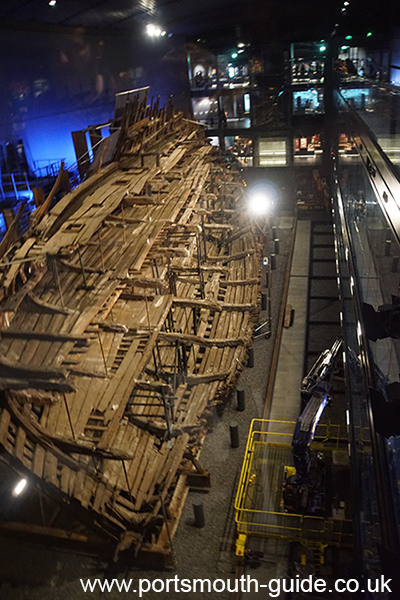 In 2013 the new Mary Rose museum opened which brought together the ship and its artefacts under one roof. Within a space of a few months the new museum had reached its 100,000 visitor. On the 11th October 1982, millions watched on television as the Mary Rose was recovered from the sea bed just off of Portsmouth where she had lain for 437 years. Between 1510-1511 the Mary Rose was built in Portsmouth within a few hundred metres from where she is now housed. The ship was named after King Henry VIII’s sister and was built in the first dry dock in the world. During the French War 1512-1514 the Mary Rose took part in battles off of the French port of Brest and in an attack on villages surrounding Cherbourg. In 1520 she took the King across the channel to Calais to meet the French King. Attempts at peace were short lived and the next time she crossed the channel was during the French War 1522-1525. In 1536 she was uprated to 700 tones and fitted with new bronze muzzle-loading guns. In 1544 war with France broke out again. In the summer of 1545 the Mary Rose set sail with 700 men on board, and it was just off of Southsea Castle that she sank, with King Henry VIII watching from Southsea Castle. She remained on the sea bed vastly unaltered until 1836 when divers John and Charles Deane discovered the site and recovered a demi cannon. Between 1965 to 1971 divers searched for the ship and exploration was started by volunteer divers. In 1978 a trench across the wreck at the bow level confirmed that two decks had survived and it was decided to totally excavate the ship. In 1979 with H.R.H Prince Charles as president the Mary Rose Trust was formed. The ship was excavated under the direction of Margaret Rule and on 11th October 1982 the world witnessed the raising of the historic ship. The Mary Rose was raised using a steel cradle lined with air bags and was designed to be the same shape as the hull of the ship. In 2003, 2004 and 2006 excavation work again took place at the Mary Rose site due to the fear that dredging to deepen the waterway into Portsmouth Harbour would destroy remaining artefacts. Many items were recovered including coins, weapons, rigging and an anchor. The hull is now housed in Dry Dock 3 and it was not until 1984 that the ship was turned upright after lying on its side on the seabed. The hull has been restored with all the timbers recovered from the site. The Mary Rose was equipped with 200 marines, 185 soldiers and thirty gunners. The rate of pay on board ship compared well with shore wages. The wages of a mariner in January 1545 were raised from 5s to 6s 8d a month. A large collection of materials from the barber surgeon have been found and put on display along with many other artefacts in the Mary Rose Museum. For more information about this attraction please see the Mary Rose website. For more details about Portsmouth's Ghost Ship Pageant please click here.